STOCKHOLM (Reuters) - The leaders of Sweden's center-right opposition Alliance urged the incumbent Social Democrat-led bloc on Wednesday to step aside and help them form a viable government to break a post-election deadlock. The rise of the far-right Sweden Democrats, shunned by both center-right and center-left, left the big mainstream blocs neck-and-neck, and short of a majority, in Sunday's election. "It is natural that the Alliance builds a government after this election result," said Ulf Kristersson, leader of the Moderate Party and the center-right's candidate for the premiership. "We want the government to respect the result and resign," he told a news conference. Without support from the center-left - or the Sweden Democrats - the Alliance of the Moderates, Centre Party, Liberals and Christian Democrats cannot take power. "The Alliance is not going to negotiate with the Sweden Democrats," Centre Party leader Annie Loof said. The Social Democrats have dominated Swedish politics for 100 years and Lofven said he would not facilitate an Alliance government by offering it support. "You can discount that idea absolutely," he told a news conference later. Preliminary election results, likely to be updated on Wednesday, show the center-left with 40.6 percent against 40.3 percent for the Alliance. That would give the Social Democrats and Greens, together with the Left Party which supports Lofven in parliament, 144 of the Riksdag's 349 seats, two more than the Alliance. Overseas and postal votes are still being counted and could change the picture. Lofven said that if the recount lifted the center-right above his bloc, the Social Democrats would go into opposition. Sweden Democrats leader Jimmie Akesson, who has tried to weed out overt racism and tone down some of the party's rhetoric to broaden its appeal, has pledged to bring down any government that does not give it influence over policy, particularly on immigration. "Our enemies have really forced us into an life and death struggle for our culture and our nation's survival," party whip Mattias Karlsson wrote on his Facebook page. "There are only two choices: victory or death." 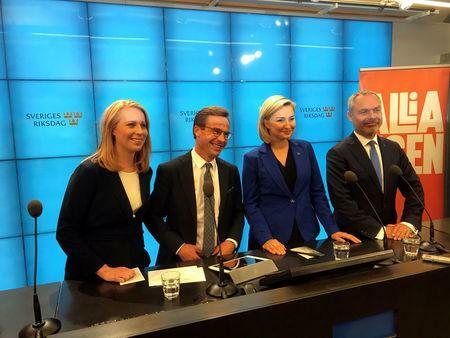 Lofven is head of the biggest party and the biggest bloc. But the Alliance argues that it has the best chance of forming a viable coalition as the center-left bloc includes the Left Party, which would almost certainly be excluded from any future administration. One side or the other will have to compromise or accept a role for the Sweden Democrats, who want to freeze immigration and call a referendum on Sweden's European Union membership. Splitting the Alliance would be likely to consign the center-right to years in opposition or as minority players in Social Democrat-dominated governments. A grand coalition would also raise questions of democratic legitimacy and support the Sweden Democrat's assertion that they are the only real opposition.